This photo was taken at the Hyatt Regency Huntington Beach in the Spa Courtyard. I love using this textured wall for the backdrop when photographing the bride and her bridesmaids. 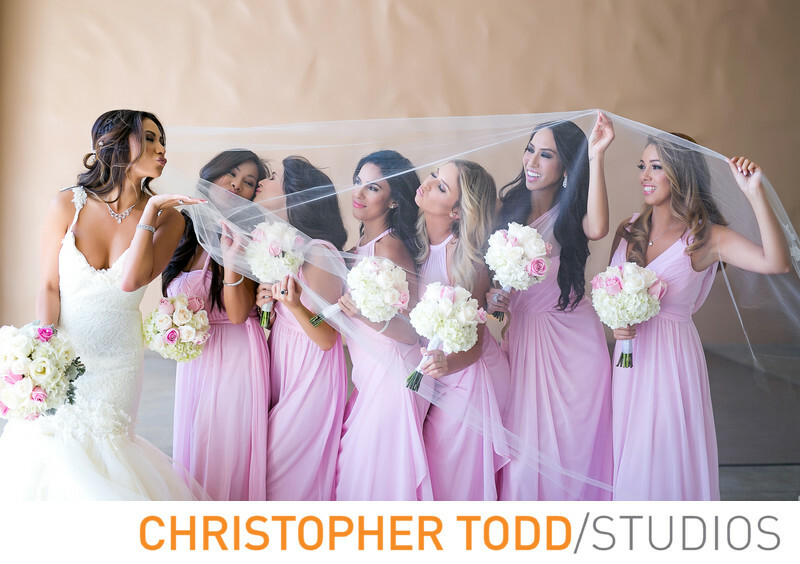 This bride wore a mermaid style designer gown and her bridesmaids wore blush pink gowns. Their bouquets were white roses with some pink roses blended together. To make this portrait fun I had the bridesmaids stand in a line with the bride's cathedral veil draped over them blowing kisses to each other. I took this photo just before the ceremony started. They held the vow exchange in the Lighthouse Courtyard overlooking Huntington Beach. 1/320; f/2.0; ISO 160; 50.0 mm.